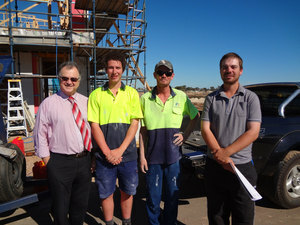 Year 12 Building and Construction student, Bryce Jericho, became the 500th St Patrick’s Technical College student to be signed up on an apprentice Contract of Training while attending the College. Bryce is employed by Jason and Steven King as a school based apprentice. Co-owner Steven King contacted the College Industry Relations Manager, Jim Montgomery, saying he was looking for an apprentice. Jim discussed the opportunity with building and construction mentor teacher, Frank Palladino, who recommended Bryce. Following a couple of weeks work experience Steven said he was most impressed with Bryce’s attitude, initiative and willingness to work and the offer of an apprenticeship was confirmed. The good news was that Steven was prepared to support Bryce in completing his South Australian Certificate of Education (SACE) this year and employ him as a school based apprentice. The Contract of Training was signed on Friday, 26 April 2013. Steven has recently entered into a business partnership in carpentry with his brother Jason. Prior to the partnership being formed Jason employed an ex-student of the College, Paul Seneca, as a carpentry apprentice in November 2011. Paul is now employed in the newly formed partnership and is currently in the second year of his apprenticeship. St Patrick’s Technical College looks upon the signing of our 500th apprentice as a very important milestone. When we originally opened in 2007 as the Australian Technical College Northern Adelaide the focus of the College was to specialise in the delivery of education that addresses trade skill shortages and results in apprenticeships for students. Since then 508 of our students have gained apprenticeships and are well on the way to establishing successful careers. Statistically seventy two per cent of students gain an apprenticeship while attending St Patrick’s. An analysis of the types of trades in which students gain apprenticeships indicates Automotive, Building & Construction and Electrotechnology are the most successful apprentice trades. It is no surprise student numbers are also greatest in these courses. This entry was posted in Community Blog, Latest News on 26/04/2013 by St Patrick’s Technical College. This entry was posted in Industry Office, Latest News on 26/04/2013 by St Patrick's Technical College.